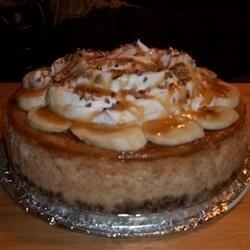 "If you like cheesecake and bananas, then you'll love this hybrid dessert recipe including pecans, caramel sauce, and dark rum." Preheat the oven to 350 degrees F (175 degrees C). Position a rack in the center of the oven. Wrap the outside of a 9-inch springform pan with heavy-duty aluminum foil. Combine flour, pecans, butter, brown sugar, and vanilla extract in a large bowl. Mix well. Press mixture into the bottom of the prepared pan. Bake crust in the preheated oven for 10 to 12 minutes. Remove from oven and let cool; leave oven on. Beat cream cheese in a large bowl using an electric mixer until smooth. Gradually beat in sugar, then cornstarch. Add eggs one at a time, beating after each addition until just blended. Add pureed bananas, sour cream, lemon juice, rum, vanilla extract, cinnamon, and salt. Beat until just combined. Pour filling over the crust. Place the springform pan in a large roasting pan; add enough water to come halfway up the sides. Bake in the hot oven until center of cake is just set, about 1 hour and 20 minutes. Turn off oven and leave cheesecake inside until cooled to room temperature, about 2 hours. Refrigerate cheesecake, uncovered, until well chilled, about 1 hour. Cover pan and return to the refrigerator, 8 hours to overnight. Cut carefully around edges of the cheesecake to loosen; remove pan sides. Transfer cheesecake to a platter. Warm caramel sauce in a small pan over low heat, stirring often, about 5 minutes. Mix in rum. Decorate the top of the cake with whipped topping and sprinkle with some pecans. Coat banana slices in lemon juice and let dry slightly. Arrange banana slices around the edge of the cake. Drizzle caramel sauce decoratively on top. Serve any leftover sauce on the side for drizzling individual slices.